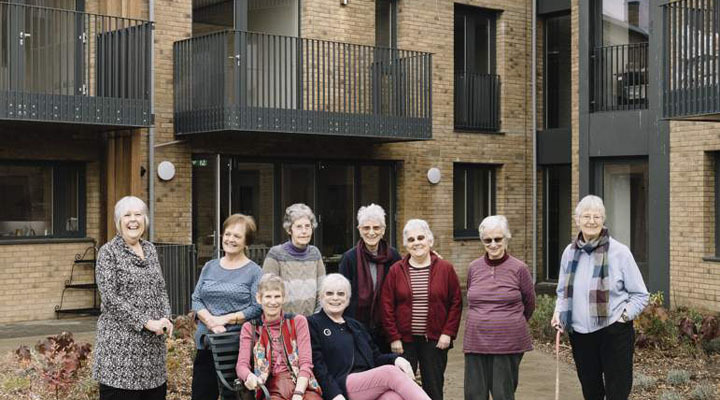 Older Women’s Co-Housing are a group of women over fifty who are the first senior co-housing community in the UK. Hanover Housing Association forward funded the scheme and OWCH moved in to ‘New Ground’ in 2016. OWCH came together as a group of women over fifty in 2003 to have friendly, helpful neighbours as they got older, as an alternative to living alone. Before moving in, the group met once a month for a shared meal, went on trips and ran workshops to prepare for living alongside one another. They are a fully mutual company, who manage their community through regular group meetings and a small elected management committee. Small service teams take care of the building, garden and outward-facing activities like membership and communications. Non-resident members join the group for events and activities, so vacancies can be filled as they arise. As OWCH wished to include women who lack equity and therefore need a rent they can afford, the group looked at partnering with housing associations. Hanover Housing Association employed a site finder who sourced a number of sites and the group chose a school site for sale on the private market. The Housing Association bought the site and forward-funded the scheme. Although the Housing Association financed site acquisition and construction, the prospective buyers paid 10% deposits. This helped de-risk the project for Hanover as all homes were presold or pre-let before construction started. Future tenants were also required to make a non-refundable ‘commitment payment’ which was graduated by tenure, but substantial enough for individuals to consider carefully their allegiance to the project. On completion, Hanover sold 17 homes to OWCH buyers and 8 to Housing for Women, a small housing association, for the socially rented units. Housing for Women financed this with private charitable grants, giving them greater flexibility to allocate to OWCH members. The 2-3 bed flats are clustered around a walled garden and all have their own patio or balcony. There is a communal meeting room with kitchen and dining areas and residents share a laundry, allotment and guest room. Hanover hired Pollard Thomas Edwards to design the scheme and worked in participation with OWCH. The group also had representation on the project and site teams.